As my list of podcasts grows and my preferences change, I’m finding it tougher to organize my shows in an effective and intentional way. With Castro 2.5, though, something clicked. Through a combination of the inbox-queue methodology and drag and drop for my podcasts, I’ve been able to rethink how I listen to my feed. For those unfamiliar with Castro, it features two locations for your podcasts to live: inbox and queue. When the latest episode of your show comes out, it’ll automatically drop into the inbox, either to be left for later or moved to queue to be played. 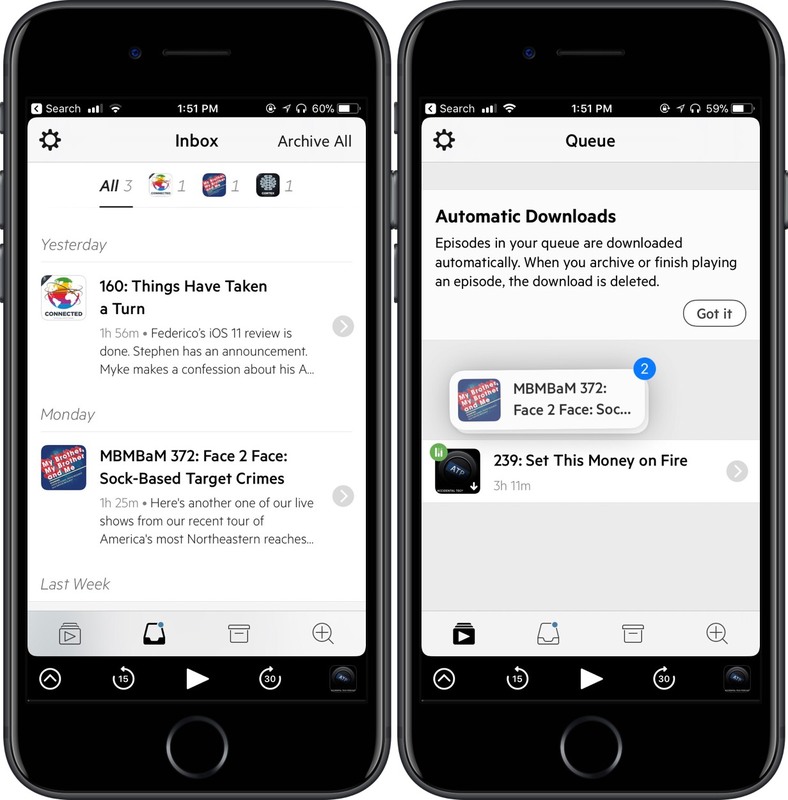 As you might expect, moving multiple episodes over to the queue could be tedious, requiring you to transfer them one at a time; however, Castro now supports in-app drag and drop on iOS 11, making it easier to swap them back and forth. The feature works like this: tap and hold a show so that it follows around your finger. Then, select any other podcast you’d like to move over to queue, tap on the queue icon at the bottom of the screen, and drop them onto that screen. You also can drag the episode on top of the icon, wait for it to open, and then drop it in the destination. All of this means you can grab as few or as many podcasts as you want, refining your queue to exactly what you’re looking to listen to. Admittedly, I’ve been a devoted Overcast user for years, but this organization method in Castro has me thinking twice. Being able to move shows with drag and drop helps me filter what I’m immediately trying to listen to, an effect that can save me a lot of time. This works both ways, too, so I can save into the inbox episodes I’m not in the mood to listen to right at that moment. If you’re a serial podcast listener like me, I’d recommend giving Castro’s 2.5 update a try. To do so, you can purchase it in the App Store for $3.99 (iPhone only) or update the app for free.